Oregon Life United’s aim is to give every taxpayer in the state an opportunity to cast their vote to stop public funding of abortion. And this summer, in churches large and small, volunteers across Oregon will gather many of the 117,000+ signatures needed to make this happen. 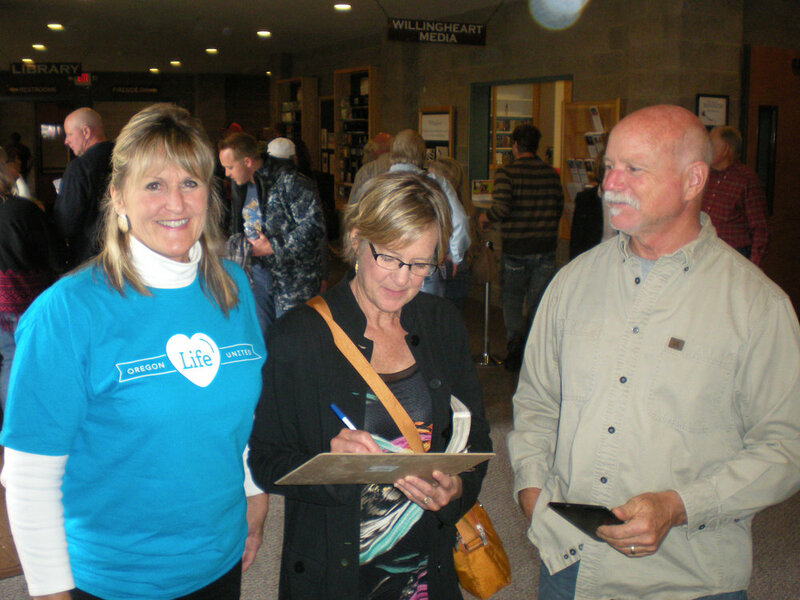 One of our newest volunteers, Susan Huntley, recently coordinated a petition drive at her church in Southern Oregon called Trail Christian Fellowship. This past weekend, Susan and her team of volunteers were able to gather about 300 signatures on the first day of their petition drive. It’s no secret that participation by Oregon churches is critical to the success of this petition drive. Simply put, we will only be successful when the Church (capital C) determines together to take a stand on behalf of women and babies who are being harmed by abortion. We are grateful for the more than 350 faith communities who have already signed up to help gather signatures. We’re well on the way to reaching our goal of 500 participating churches by the end of this summer. Talk about the petition from the pulpit. These speaking notes (PDF) can help you or your pastor to communicate with church members about the petition. Gather signatures before and after church services. We recommend scheduling your petition drive on two or more consecutive weekends this summer. Pray for other churches to become involved. Also pray for wisdom and protection for petition organizers, those who are helping to gather signatures, and others who are on the front lines of this important battle. Talk with your pastor this week about why protecting women and babies from abortion is personally important to you. Then, ask for permission to gather signatures on Sunday mornings (or whatever day your church meets). Additionally, you’ll find resources for planning and promoting your petition drive at www.StopTheFunding.org/churches. If you have any questions about gathering signatures at your church this summer, click the link above or contact Shannon Henshaw at (541) 286-3039 ext. 702 or shannon@oregonlifeunited.org.